Kim Kardashian is more than just taking a page out of Naomi Campbell’s fashion book — she’s copying the whole book! Kim has been wearing Naomi’s ’90s catwalk looks, despite the family feud they have with the supermodel. Even though Kylie copied one look, it’s Kim who has started the whole trend. Kim recreated a blue and purple silk Versus Versace dress she wore to Chance the Rapper’s wedding earlier this month, which featured lace details down the side. The silky negligee was first worn by Naomi on the Versace runway in 1996 and the only difference was the slit on the side of the dress was much more cutout on Naomi. Another look worn by Kim was the black leather Versace Fall 1992 Laden strap mini dress covered in buckles, which she wore to the 2018 Met Gala after party. However, the dress was originally worn by Donatella Versace, herself, followed by Naomi who wore it on the 1992 runway and in the TV show The Face back in 2013. Naomi then dazzled at the 1997 MTV Video Music Awards when she donned a sparkly crystal, chain metal mini dress with a cowl neckline. Kim then chose to wear the same exact dress to the December 2018 Versace fashion show, showing off much more cleavage. Another look that Kim copied in December 2018 was a gorgeous sleeveless silver feathered Versace gown when she attended the premiere of The Cher Show in NYC. The dress featured sheer fabric, embellishments and a mock neckline. It was also the same exact dress Naomi wore back in 2015 at The Fragrance Foundation Awards which featured an open back. 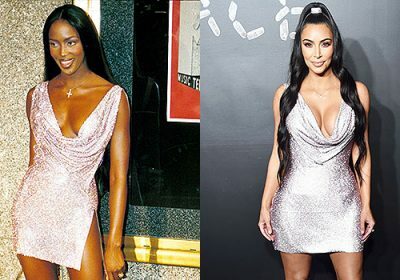 Kim’s most recent copycat look, though, was in Paris on March 6, and was surprisingly not Versace, however it was still inspired by ‘90s Naomi. Kim donned a completely sheer, skin-tight Azzediene Alaia cheetah patterned jumpsuit with just her private parts covered with velvet patches. Kim accessorized the outfit with a black beret and pointy-toed pumps which is the exact look that Naomi modeled in 1991. Naomi first rocked the look on the Autumn/Winter 1991/92 runway show in Paris. Meanwhile, just one day before that, on March 5, Kim stepped out in a head-to-toe cheetah print Azzedine Alaia Fall 1991 runway look featuring a tight jumpsuit with a matching long coat and boots. Although it wasn’t Naomi who wore this exact outfit on the runway, Naomi wore an almost identical look on the same exact runway, except her look consisted of just a pantless bodysuit and coat. A day after Kim was spotted in the outfit, Naomi posted the photo of her in the cheetah look to Instagram, shading Kim. In the past, Kim has opened up about loving vintage Versace and how she researches her looks months in advance so she can plan out how to recreate them, however Naomi doesn’t seem to be too happy. Plus, this revelation comes on the heels of Kim’s ordeal with fast-fashion brand Fashion Nova, which recreates every outfit Kim wears and sells it for cheap, upsetting the designers who dress Kim. See All the Photos From Kim and Kanye's Epic Winter Wonderland Christmas Party!